When people think of therapy dogs, pit bull terriers* probably aren’t the first type of dog that comes to mind and yet there are many pit bull terrier-type dogs serving as therapy dogs across the United States. Perhaps the most well-known and dramatic examples of pit bull terriers becoming therapy dogs are among the Vicktory dogs. Many today can still remember the 2007 case where a then-famous football quarterback, Michael Vick, was found guilty and sentenced to federal prison for promoting dog fighting and engaging in the torture and killing of dogs. Forty-nine dogs were seized. All but one were sent to animal rescue groups. Best Friends Animal Sanctuary took the 22 most traumatized dogs and gave them the training, veterinary care, and the in-depth emotional support they needed. Now referred to as the “Vicktory dogs,” most went on to find homes, many in families with children and other dogs. Several went on to become service dogs or therapy dogs. Johnny Justice serves as a therapy dog in San Francisco and was named ASPCA Dog of the year in 2014 for his work with terminally ill children. Sox and Hector both received therapy dog certification as well, and spend their days at hospitals, nursing homes, and schools. presences were felt.” At 10-years-old Blueberry still serves as a therapy dog visiting hospices, schools, and hospitals. 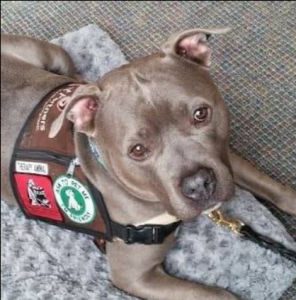 Rescued shelter pet, Jeffrey, another pit bull terrier-type dog visited with students at Sandy Hook elementary school in the aftermath of the shooting tragedy that killed twenty children and six adults. He developed a special bond with one student, Emma, and started visiting her at her home to help her overcome the trauma. Today Jeffrey continues as a therapy dog visiting schools, retirement homes, and libraries. 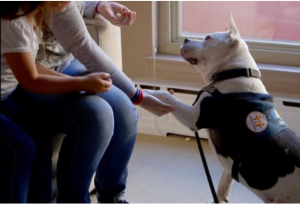 There are countless other examples of pit bull terrier-type dogs serving as therapy dogs (including Alladin, a finalist in the 2017 American Humane Hero Dog Awards). There can be no doubt that pit bull terriers can be good therapy dogs. The bottom line is that pit bull terrier-type dogs are just dogs. They are intelligent and do the same jobs that other dogs do. They go through basic obedience training, they earn Canine Good Citizen certificates, and yes, they become therapy dogs. And like all dogs, they are individuals with their own unique personalities, talents. and skills. *The term “pit bull” or “pitbull” refers to an ill-defined type of dog, rather than a breed. Learn more about pit bull terriers. Is a Pit Bull a Breed?